By booking your MSC Divina cruise with SouthAfrica.TO you qualify to earn travel vouchers! Simply email your writeup and photos to cruises@southafrica.to and we'll send you vouchers. Easy. The MSC Divina is the third of the Fantasia-class cruise ships and is even more breathtaking than her predecessors, the MSC Fantasia and the MSC Splendida. In Southern Africa we have experienced the Musica-class cruise ships: the older MSC Melody has now left our waters, MSC Sinfonia and as well as the MSC Opera. And we now have the delight of boarding the MSC Musica! 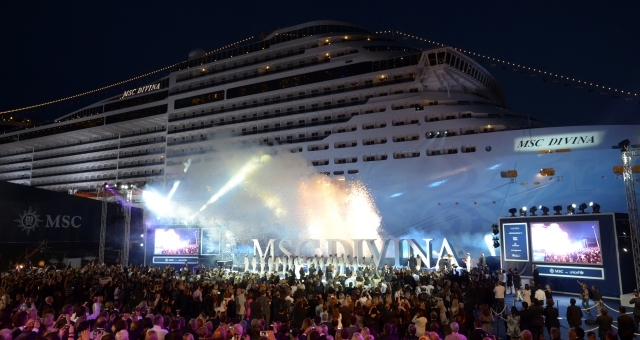 We are taking cruise bookings up to 202 for the MSC Divina. You can check availability by filling in the form below (email cruises@southafrica.to if you're experiencing difficulties). 2 Nov 2013. The MSC Divina leaves Venice for Miami, and the casino (except in limited areas during certain hours) is becoming non-smoking as well as the Black & White Lounge & Top Sail Lounge in the MSC Yacht Club - smokers can still take refuge in certain parts of the port side deck on deck and the Cigar Lounge. August 2013. Smurf-themed programs are introduced for children to celebrate The Smurfs 2 being released. 30 March 2013. Video footage of embarking on an MSC Divina cruise from Venice. 25 May 2012. First cruise from Marseille, France. 19 May 2012. Christening in Saint Nazaire, France. Sophia Loren christened this incredible ship. If it is good enough for this silver screen goddess, it's most certainly good enough for me. 3 September 2011. Floating test in Saint Nazaire, France. Boasting a length of 333.3 meters and a beam of 37.89 meters, the MSC Divina is 82 meters longer than the largest Musica-class ship cruising Southern Africa, the MSC Opera. The Divina has had some spectacular additions to its sisters' already impressive amenities. The MSC Yacht Club is reserved for the 100 passengers booking cabins in this specific category. The most incredible new feature is the infinity pool at the back of the ship. Can you imagine, floating in a pool with the horizon and the ocean stretching out in front of you? 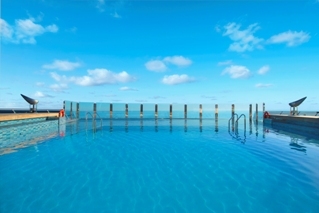 This pool is for the exclusive use of MSC Yacht Club Members, and offers a more refined environment (the pool area for other cruise passengers can get a bit crowded during days at sea). 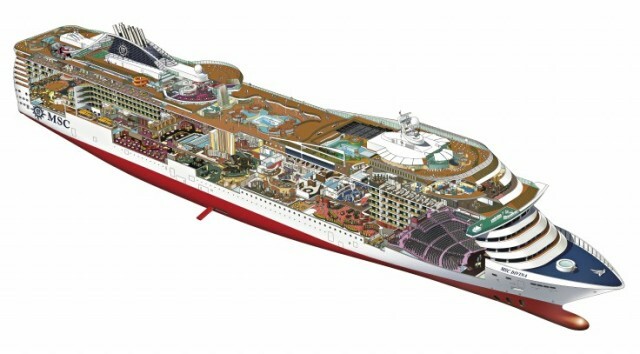 You will then gain access to some incredibly designed areas of the ship and a butler service! Because there's only 100 passengers in the area you get to know them. Be prepared to pay for it though, these beautifully placed cabins come at a steep price, but if money is no object, you shouldn't even think twice about booking it! Click here to watch a video of this impressive ship's floating test and construction. There are seven restaurants onboard, yes, that's correct. 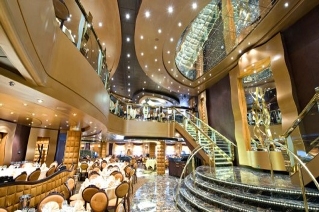 The main restaurant, The Black Crab, can seat 1155 passengers in one seating, spanning two decks! The Pantheon Theatre is equally impressive, boasting 1603 seats. The impressive Aqua Park (2091 square meters) with its many fountains will keep your children entertained and pleasantly surprised. There is also a waterslide for the older kids and smaller pools and whirl pools for the grown ups. You can also spend some quality time in the excellent shops onboard, the 4D cinema and the plethora of cocktails bars around every corner (20 in total! ), each offering a different view of the ship and the ocean. You can go bowling, dancing, gambling, go to the gym, go walking; there is just so much to do! Another stunning feature is the Aurea Spa. Personally, I'd start with an invigorating Turkish bath, enjoy an hour long, full body massage followed by an aromatherapy session and then a nice nap in my gorgeous cabin. I would then call my butler, order a divine cocktail and sip it on my private balcony. Doesn't that sound like something you could enjoy right now? This magnificent ship will call at the following ports: Barcelona, Bari, Casablanca, Civitavecchia, Dubrovnik, Funchal, Genoa, Heraklion, Istanbul, Izmir, Katakolon, Kotor, Malaga, Marmaris, Messina, Piraeus, Santa Cruz de Tenerife, Valletta and of course, Venice. Remember to pack some smart clothing for the gala dinner and photos with the captain. The video below also has footage of a dance competition on the MSC Divina.